With less than a week until the Xbox One X hits stores, we've finally got our hands on a final retail review unit and have duly unboxed this beauty to get a closer look at the world’s most powerful console. In the video below, we dig out what’s inside the Xbox One X box so you know exactly what to expect. There’s a lot of tech inside the svelte One X, and you’ll be amazed at how compact it is compared to the original Xbox One and even the revised Xbox One S. Drop your jaw in amazement as TechRadar’s Paul Taylor picks up the console, inspects it for a bit, and stacks it up next to its older siblings. Exciting stuff. Did you see the power cable, the codes to Games Pass, and Xbox Live? There’s a bunch of other paperwork too, but you won't be interested in that when you're filling your eyeballs with screaming-fast 60fps 4K games. A lot of people will be thrilled to know the One X has a tactile power button rather than a capacitive touch button. While the chassis is a similar size to the Xbox One S, the exterior is radically different. 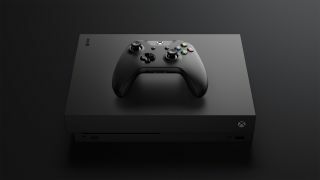 We’ll have more Xbox One X footage soon (once those pesky embargoes have lifted!) and witness what games look like running on this 4K beast compared to the Xbox One. Aussie gamer looking for a shortcut to the very best Xbox One games? Check out Official Xbox Magazine's new bookazine, The 100 Greatest Xbox One Games — just AU$14.95 with free shipping!